and easy to follow method that can be monitored with a fluorescence reader. 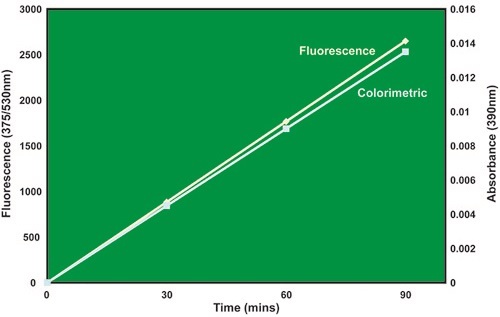 releases AFC free dye and undergoes a fluorescence shift. The reaction is selectively and irreversibly inhibited by the peptide Z-VAD-FMK (fluoromethyl ketone). standard curve established with an appropriate free dye. used with purified enzyme preparations, cell extracts or tissue lysates. caspase inhibitor Z-VAD-FMK for establishing proper positive and negative controls and standards. Colorimetric Caspase Assays are also available. Rao, S. et al ( 2016) Evaluation of the anticancer potential of coffee beans: An in vitro study.indian journal of traditional knowlege 15:266.